These were the principles that the greatest Mafia 'Boss of Bosses,' Joseph Bonanno, lived by. Born in Castellammare del Golfo, Sicily, Bonanno found his future amid the whiskey-running, riotous streets of Prohibition America in 1924, when he illegally entered the United States to pursue his dreams. By the age of only twenty-six, Bonanno became a Don. He would eventually take over the New York underworld, igniting the 'Castellammarese War,' one of the bloodiest Family battles ever to hit New York City. 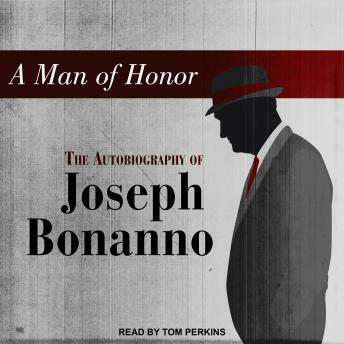 Now, in this candid and stunning memoir, Joe Bonanno-likely a model for Don Corleone in the blockbuster movie The Godfather-takes listeners inside the world of the real Mafia. He reveals the inner workings of New York's Five Families-Bonanno, Gambino, Profaci, Lucchese, and Genovese-and uncovers how the Mafia not only dominated local businesses but also influenced national politics. A fascinating glimpse into the world of crime, A Man of Honor is an unforgettable account of one of the most powerful crime figures in America's history. The narrator should have gotten better acquainted with the pronunciation of Italian names and words. Very distracting.